That explains everything about how the Indian guy who eats nothing but curry can defeat four grown men in rubber suits without break a sweat. No, Japan is not racist at all. What are you talking about? This was a very solid episode, but I have very little to say about it. As I said last week Tsuritama’s story is very traditional. Despite the fancy trappings, the story is one of the oldest there is. A group of friends come together, overcome challenges, and defeat the Beast with the power of friendship. That’s not to say Tsuritama isn’t an excellent and original story though. It’s all about how you tell the story. 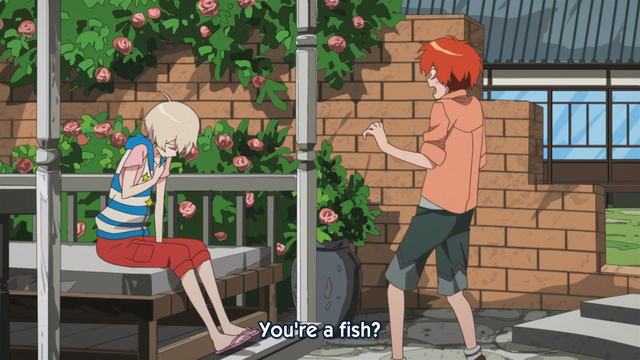 And Tsuritama tells it like no one’s ever told it before. The animation, the excellent soundtrack, the fishing theme and the quirky Duck squad are certainly unique. I use this comparison a lot, but one of my favorite fantasy novels is David Eddings’ Belgariad. Even if you’ve never read the book, you’ve heard the story a thousand times. A peasant farm boy goes on an adventure, discovers his secret birthright, saves the world and marries the princess. It’s the most unoriginal story ever. And yet, I love this book. He tells the same story, but better than anyone has ever told it before. 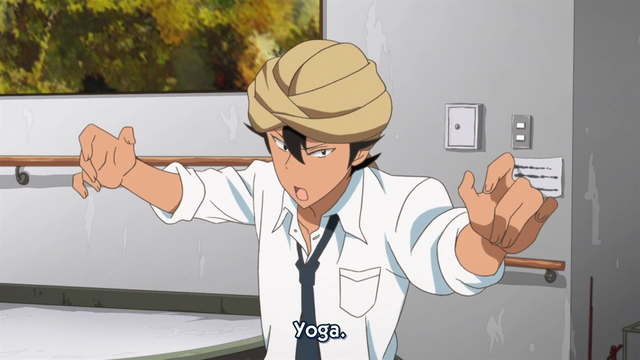 Tsuritama is much the same. I remember The Belgariad! The worldbuilding was kind of silly and the plot unoriginal, but there was some great dialogue and just about every character in the series was pretty damn likable. It was a lot of fun, although I’ve heard that Eddings told the exact same story in all of his other books, which maybe takes a bit of the fun out of it. For me, it’s the little details that really make this show. Did you catch that the reason why Haru had a fishbowl on his head in the first episode was that so he could communicate with his sister through the water? Tsuritama’s quite different from Mawaru Penguindrum, but I think that Nakamura and Ikuhara share a similar eye for seemingly nonsensical imagery that reveals itself to make total sense once you have the context for it. Also I’m surprised you didn’t mention the ending. That cliffhanger was EVIL. I’ve heard that Eddings told the exact same story in all of his other books, which maybe takes a bit of the fun out of it. Pretty much. But I read the Belgariad first, so that made me like it. Plus, I do think it’s his best work. As for the cliffhanger, the guy who “died” is an idiot. If there’s one thing I’ve learned from anime, it’s that idiots can’t die. Although perhaps this show will prove me wrong and break with the pattern, but I doubt it.